Some people in Thailand had a tricky time traveling along earthquake-damaged roads on Tuesday. The magnitude 6.0 earthquake struck northern Thailand on Monday, causing some damage to buildings and roads and knocking goods off shelves in shops. There were no immediate reports of any casualties. The quake struck 17 miles southwest of the town of Chiang Rai, the U.S. Geological Survey (USGS) said. It was felt in the Thai capital of Bangkok, and in neighboring Myanmar. 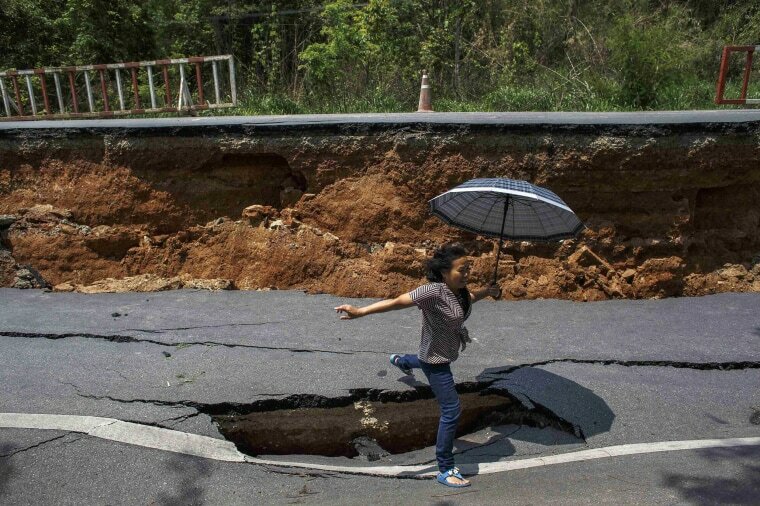 Above: A woman with an umbrella jumps over a hole on a highway road Tuesday, damaged by Monday's earthquake in Chiang Rai, in northern Thailand.